FNU Assistant Registrar, Karishma Deo (second row, second from right) with Young Women Lead Initiative participants and FWRM staff at FNU Nasinu Campus. 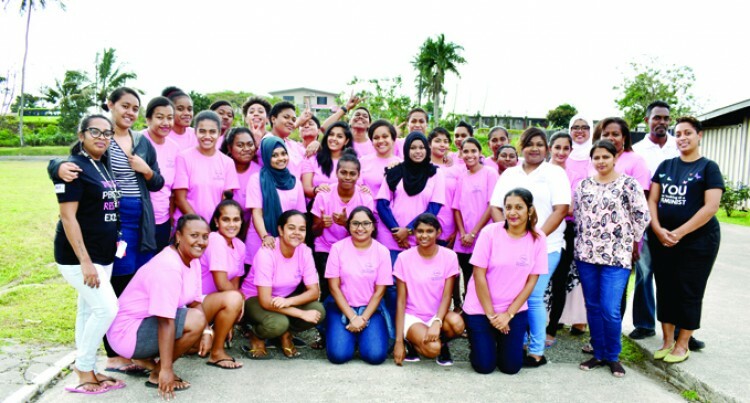 The Fiji National University (FNU) hosted the inaugural Young Women Lead Initiative workshop at its Nasinu Campus over the weekend. This was in conjunction with Fiji Women’s Rights Movement (FWRM) and the Emerging Leaders Forum Alumni (ELFA). The aim of the two-day workshop was to empower young female students to take up more leadership roles at the university. Thirty students from the five colleges of FNU in the Central Division attended the workshop. FNU Assistant Registrar, Karishma Deo said such workshops were important because it created greater awareness and also empowered young women to take up leadership roles. Ms Deo said such initiatives encourage students to make bold decisions. “We have observed that young women are hesitant to take up leadership roles and by organising such workshops we hope they are empowered to take on this challenge,” Ms Deo. Bachelor of Laws final year student, Ilisapeci Tunamena said through the fun activities she has been able to discover that she possessed the qualities and the skills required to be at the helm. “I have personally achieved a lot from these two days. I am skilled, challenged and at the same time being motivated to take up leadership roles at FNU,” Ms Tunamena said. Trade Diploma in Applied Computing student, Shagufta Aisha Begum said interacting with students from other colleges during the workshop was a great learning experience. “We were all from different colleges and did not know each other prior to the workshop and it was incredible listening to the views of other girls about young women in leadership,” Ms Begum said. “I feel motivated and challenged to compete for leadership roles in the university student bodies. FNU has organised similar workshops at other campuses in the northern and western divisions.